Spoilheap.co.uk was originally set up as a web-based archaeological resource in 2000. Since then, it has grown and developed into a teaching aid for universities and colleges across the world. With over twenty years' experience, Spoilheap Archaeology is able to offer a full post-excavation management service and specialist work on artefacts. 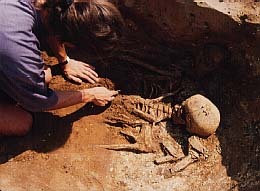 We can offer specialist assessment and analysis of human skeletal remains, post-Roman pottery, ceramic building materials and fired clay. We can provide an identification service and advice on most other artefacts. Details of our services, key projects and publications can be found on this website. After you've had a look around, please email us for a quote. No project is too big or too small. "Spoilheap" was launched in June 2000. Last update September 2013.